Dreamy and affordable, this design combines a facade of gables, stone, and stucco with an incredible interior. The great room's fireplace is partnered with a built-in, while the dining room features columns. 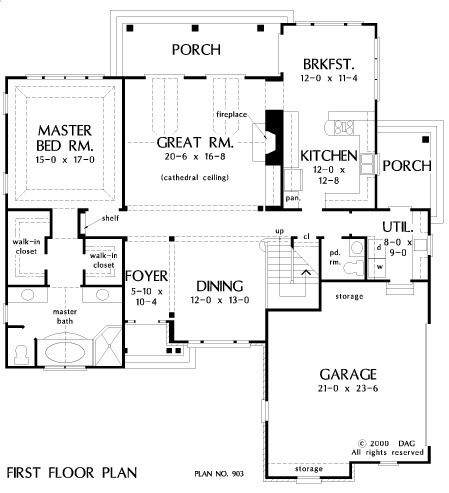 A spacious utility area leads to a private porch, and the back porch is easily accessed through the common rooms. 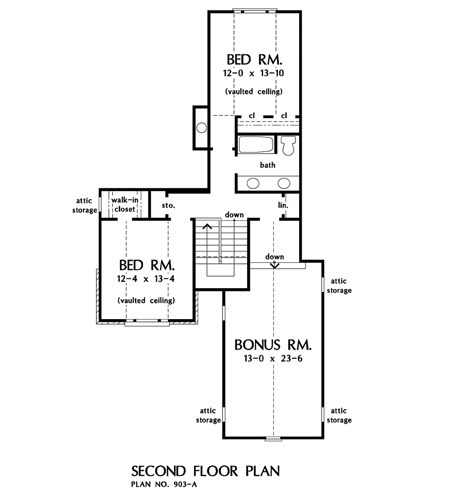 2nd Floor: 600 Sq. 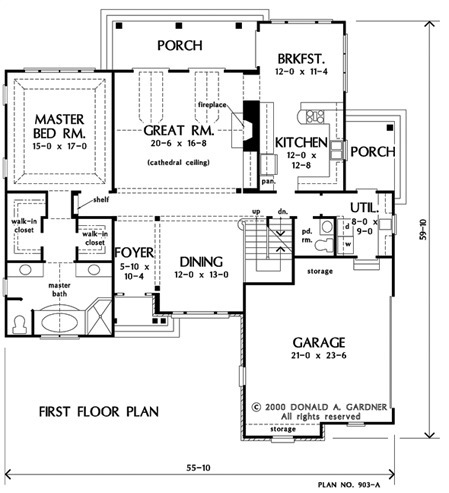 Ft.
House Dimensions: 55' 10" x 59' 10"
Great Room: 20' 6" x 16' 8"
Garage Storage : 8' 4" x 3' 4" x 0' 0"
Bedroom #2 (Vaulted): 12' 4" x 13' 4" x 11' 10"
Bedroom #3 (Vaulted): 12' 0" x 13' 10" x 9' 10"
Bonus Room : 13' 0" x 23' 6" x 9' 0"
Breakfast Room : 12' 0" x 11' 4" x 9' 0"
Foyer : 5' 10" x 10' 4" x 9' 0"
Garage : 21' 0" x 23' 6" x 0' 0"
Garage Storage Bay : 10' 8" x 2' 0" x 0' 0"
Great Room (Cathedral): 20' 6" x 16' 8" x 17' 9"
Master Bedroom (Tray): 15' 0" x 17' 0" x 10' 5"
Porch - Rear : 20' 8" x 7' 0" x 0' 0"
Porch - Front : 5' 0" x 4' 4" x 0' 0"
Porch - Right : 7' 0" x 10' 0" x 0' 0"